After overcoming last issue’s obstacles, Rom is now on the hunt for his stolen Neutralizer. First he has to see how Brandy and Steve are who just so happen to be sitting in jail under suspicion of Artie’s death from their battle against the Thornoids. After breaking them out of jail, and checking to see there were no Wraiths among them, Rom heads to Washington and Project Safeguard. 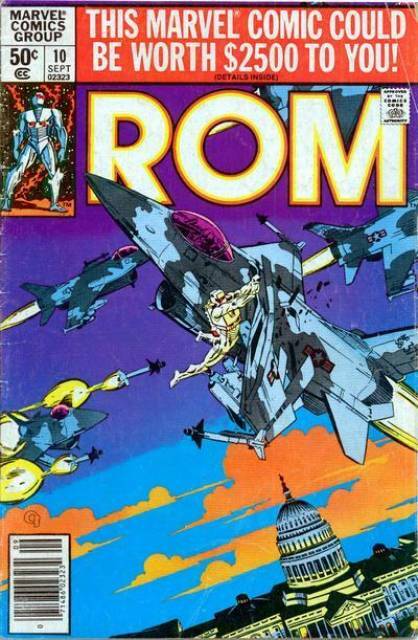 Not realizing that a flying silver robot might raise some alarms, Rom is attacked by fighter jets while Bill Mantlo leaves the book on a big cliff-hanger. Sal Buscema and author Bill Mantlo give the readers another fun-filled, action-packed epic with this issue of Rom. The Dire Wraiths have to be some of the vilest and diabolically clever aliens in the Marvel Universe to do what they have been doing thus far as they have really been giving our hero a hard time. Adding to the fact that Rom is still having problems understanding Earth laws, customs and manners, things could not be harder for the Spaceknight. Mantlo also plays up the love triangle a bit more with this particular issue and it will be interesting to see where it goes, especially if you factor in the memory of his former flame to make everything just a bit more complicated. Top-notch writing and solid artwork make this a fantastic book.